A song to play while reading about the Dodgers: “Walkie-Talkie Man” by Steriogram. This was one the best songs on one of the best soundtracks of one of the best baseball video games ever: MVP Baseball 2005. And the 2019 Dodgers can be one of the best teams ever. The Los Angeles Dodgers enter the 2019 season coming off their second straight World Series appearance. Now, they lost both years to the Astros and Red Sox, respectively, but always props for playing deep into October! The goal in 2019 remains the same as the last two years: play in and win the World Series. Seriously. This time it matters. There’s only one October and the Dodgers need to finish the tenth month of 2019 with a champagne celebration and a date for a parade in Los Angeles. Despite turning over the roster, the Dodgers actually had a relatively quiet offseason. There was no (at least publicly) big push to retain Manny Machado or to snag Bryce Harper. Clayton Kershaw opted out and re-signed in what seemed like no time at all. Corey Seager will return to shortstop after a season lost to injury. After a bounceback 2018 season, Matt Kemp was traded – along with Alex Wood and living meme Yasiel “#PuigYourFriend” Puig – to the Cincinnati Reds. Kemp, the onetime face of the franchise, parted ways with the Dodgers in 2014 in a trade to the San Diego Padres. The Friars then shipped him to the Braves who would later return Kemp to the Dodgers in a trade that would include Homer Bailey (whose contract was included only for the Dodgers to release him) and a prospect named after Derek Jeter. Although the Braves trade was looked at as a piece of accounting magic, giving the Braves and Dodgers financial flexibility in the years they each wanted it most, Kemp surprised the world in two ways: not being traded during the 2018 season, and playing well. When the new Dodgers ownership took over in 2011 and Kemp signed for 8 years and $160 million as the NL MVP runner up the sky was the limit. Just 27, Kemp was in line to be a Dodger for his entire career. After two injury-plagued seasons and one full season that saw Kemp post his worst full-year bWAR, the Dodgers moved on. In his MVP-caliber 2011 Kemp hit 39 home runs and stole 40 bases while putting up 8.0 bWAR. Before the trade to the Padres, in 329 games across 2012, 2012, 2014 the outfielder hit 54 balls out of the park and swiped just 26 bags. And totaled just 4.6 bWAR. And he trailed off from there for the Padres and Braves. He always contributed, was worth positive WAR, and slugged a bit. But the star, the Matt Kemp who the Dodgers wanted to keep in LA for life, was gone. Throughout spring training 2018 the question was where Kemp would go next. And as time passed it became clear he wasn’t going anywhere. His 2017 .276/.318/.463 with 23 home runs wasn’t eye-poppingly good or bad (although -1.4 bWAR eek!) but it wasn’t lighting up the phone lines. Back with the Dodgers though, something clicked and a little bit of the old Kemp returned: 290/.338/.481 with 21 home runs. He boosted his walk rate from 5.8% to 7.1% – his best since leaving the Dodgers, kept his strikeouts about the same, and maybe got a little sprinkling of BABIP-aid. When all was said and done, he gave the Los Angeles fans who saw him play from 2006 to 2014 a second sendoff, including a home run in the World Series. With Clayton Kershaw struggling with injuries and perhaps entering a decline phase of his own, Matt Kemp’s second departure may have closed the book on the Dodgers era that played out under Frank McCourt. Those memories, that trio of Kershaw, Kemp, and Andre Ethier (or Jonathan Broxton) has moved on. What is the Dodgers’ most recent accomplishment? The Dodgers are back-to-back World Series runners-up! Los Angeles was just the first team to appear in consecutive championships since the 2010-2011 Texas Rangers, and before that it was the New York Yankees appearing four times in a row from 1998-2001. Combined, these teams won the World Series three times and lost five times in eight appearances. Sure, all the wins were from the Yankees but who’s counting. Make the last October baseball and pat yourself on the back for a pretty good year. 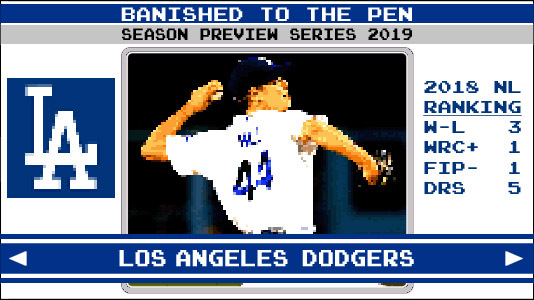 How will the Dodgers define success in 2019? Winning the World Series. They’ve lost two years in a row at baseball’s highest level and the bar is set: they must win. A division crown is fine. A league championship is great. But without a trophy even the difficult task of making it to the World Series three years in a row would ring hollow. They were good enough to defeat the Astros or Red Sox, they just didn’t. It happens. But it’s happened twice now and no team can ever count on being back (see Washington Nationals, Stephen Strasburg Rules). Rich Hill, patron saint of Effectively Wild, Holder of the Sacred Chalice of Rixx, Heir to the Holy Rings of Manfred. No player this side of Willians Astudillo more completely carries the EW mantle (visit the wiki for the origin story). Hill was even in the mix to start on Opening Day before succumbing to his only weakness: injury. On May 30th against the New York Mets, the Dodgers will be giving away a Sandy Koufax jersey to fans in attendance. While supplies last, of course, but this is not only cool (Koufax! ), it’s also not only limited to the first 12,000 or a special ticket. Go to the game, get a jersey, remember an ace. What’s not to like?